BentoLunch.net - What's for lunch at our house: It's Friday again! And another edition of meatless Friday at that. For the record, Faith never seems to notice the presence of or lack of meat in her lunches. She's definitely my kid not Shaun's. ;o) If she was his, she'd be holding her fork and demanding beef! Faith has a boiled egg that was supposed to be shaped like a bear but I bought smaller eggs and now it doesn't have ears. 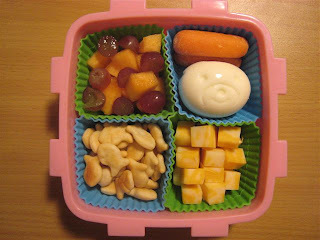 To go with that, she has carrots, cheese, parmesan Goldfish, canteloupe & grapes. She also has a cute little Littlest Pet Shop container that has some chocolate Goldfish and Yogos in it. I forgot to take a picture of it. Okay teach me about this Bento thing. I don't understand what exactly it is or how you decide what to make. Is there a place to go for ideas. Where do you get the containers? All that stuff. Give me the scoop.